I saw a recipe for black cod the other day and was dying to try it. Traditionally, I don’t cook much fish at home because I hate overcooking it. Alas, this is where sous vide comes in. Perfectly cooked fish, every time. In addition to adapting the original recipe for sous vide, I’ve included a step of brining the black cod prior to cooking which is a tip I got from Michelle Tam over at Nom Nom Paleo. The brining is a game changer because it prevents albumin from forming on the fish after cooking. While harmless and not affecting taste at all, I don’t like the sight of it. Personally I found Michelle’s recipe a little bland for my liking and prefer this preparation much more. Enjoy! Crumble the saffron into the wine and let it steep until the saffron begins to color the wine, about 15 minutes. Add the oil to a medium skillet over medium heat. Add the shallots and cook until softened, about 2 minutes. Add the wine, saffron and thyme, if using. Bring to a boil and cook until the skillet is almost dry, about 3 minutes. Taste, and remove the thyme before it becomes strong. Add the clam juice. Bring to the mixture to a boil and cook until it is reduced by about half. This will take about 5-6 minutes. The sauce will be quite flavorful at this point but don't fret, because as mentioned in the original recipe, the cream will mellow the intensity of the flavor quite a bit. Pour the mixture through a strainer into a bowl or glass measure, pressing on the solids. Discard the solids and return the liquid to the skillet. Add the cream, bring to a boil and reduce until the sauce coats the back of a spoon and is the desired consistency. Taste and adjust the seasoning, adding a squeeze of lemon juice, if needed. Heat the sous vide bath to 125F. If you didn't have your fish monger debone your fillets, this is the time you break out your tweezers and remove all the pin bones. (I highly recommend these Kotobuki tweezers. Absolute game changer.). Combine the table salt and water in a measuring cup to make a 10% brine. Put the fish into a large ziploc bag and pour in the brine. Let them sit on a bowl of ice or in the fridge for 10 minutes. After 10 minutes, remove the fish from the bag, rinse them with tap water in the sink and pat dry with paper towels. Sprinkle each fillet with some pepper on both sides. At the 15 minute mark while the fish is cooking, heat up a cast iron pan on medium high and melt the clarified butter. Once the fish is done in the sous vide bath, remove each fillet very carefully and pat dry with a paper towel to remove excess moisture. Cook each fillet, skin side down, in the cast iron pan until the skin is brown and crispy, about 20 seconds. You have to make sure your pan is hot enough and you don't cook too long, otherwise you'll overcook the fish. 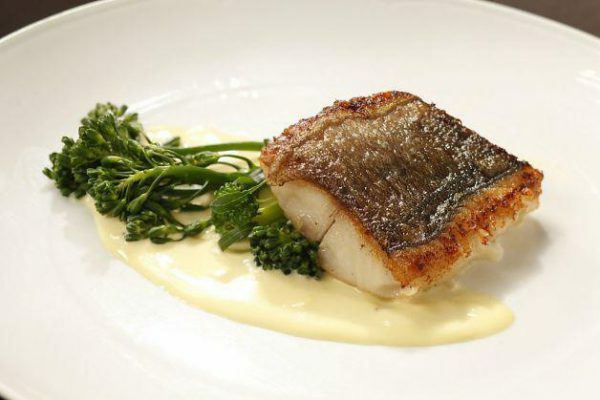 Once done, plate the fish and serve with the saffron cream sauce you previously prepared. I recommend preparing the sauce ahead of time as it will allow you to time everything more closely together. Adapted from the original recipe at SF Gate. As this will be part of a 5 course menu , the pieces for fish will be cut quite small. Do I need to shorten the cooking time or shall I sousvide larger pieces and cut them before I pan fry skin? The cook time would be the same. However, I would keep them larger since pan frying will be easier. After you pan fry, cut them into the smaller portions you need.